A free oracle card reading for the full moon on August 10, 2014. 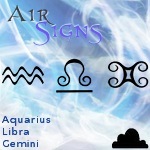 This reading is for Fire Signs; Aries, Leo, Sagittarius, using the Kuan Yin Oracle by Alana Fairchild. 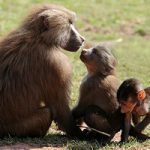 In this post, I will be reporting what the August 2014 full moon energies bring to you and how best to harmonize with them. The August full moon is known as a Ripening Moon in many traditions. A single oracle card was drawn for the Fire Sign full moon reading this month. The result is #42 Turquoise Lotus Mother. 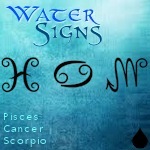 As a Fire sign, your nature is one that is bold, dynamic and courageous. You have a charming sense of humor that can transform the mood of a room. As the moon cycles through her phases from new to full, the effects of Her dynamic energies are mirrored here on Earth. The emotions of Fire Signs can become even more bold, charismatic and ignited with encouragement during the full moon time. It appears that the Fire sign is experiencing a trend of colors! Last month’s card for you was related to the color Emerald which spoke of drinking in all of the love and support around you. 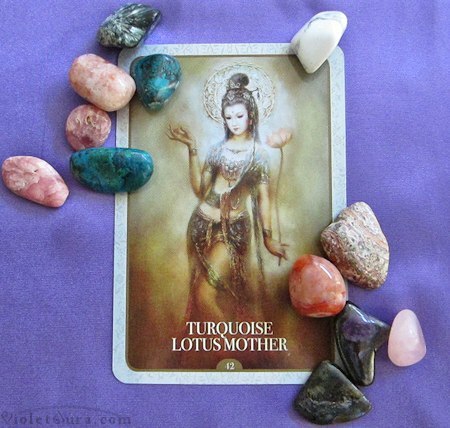 The energy of this month’s Turquoise Lotus Mother Card card is another one from the Light spectrum which invites you to use your voice as a method of healing. This card asks that you make peace with your inner critic (and your inner cynic!) Begin to use your words more proactively to speak kindly to heal yourself and others. You who have a temperament filled with such passion will have an opportunity this month to develop your emotional voice. Your spirited thoughts and words can ignite energies within yourself and others that are loving, nurturing and so very needed during this time of the year. You can also heal with the help of media designed to assist you. Use the support wherever and whenever you can. Mantras and affirmations will help guide you consistently if used regularly. 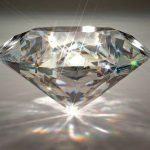 Share positive quotes, pictures or articles that you find. Don’t just look. Share! Listen to music, playlists, lectures or meditations that are uplifting and inspiring and share them. 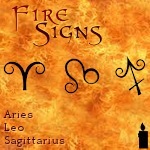 There is another running theme with Fire signs that has been standing out in recent months. The energies around you are suggesting more and more strongly that if you synchronize with loving and healing energy it is the way to propel yourself forward and out of unfortunate and “bad luck” situations. If you work with these emotionally freeing energies you will begin to enjoy the benefits of a satisfying life. 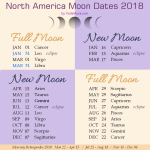 With the August full moon being the “Ripening Moon“, it is an extraordinary opportunity to develop your capacity to heal and experience the highlights of your journey with the next month’s full moon being the Harvest Moon. 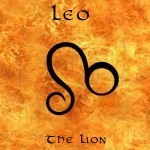 Do you know someone who is born a Leo, Aries or Sagittarius? Don’t forget to share with them!